Mike Gleason: It is my privilege now to welcome in Axel Merk, President and Chief Investment Officer of Merk Investments and author of the book Sustainable Wealth. 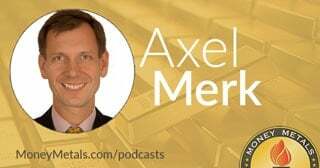 Axel is a well-known market commentator and money manager and is a highly sought after guest at financial conferences and at news outlets throughout the world. It's great to have him back on with us. Axel, it's always a pleasure and thanks for joining us again. Mike Gleason: Well, before we get into other matters like Fed policy and the latest on trade wars and so forth, Axel, I figure a good place to start is with what appears to be a stock market that keeps acting like it's coated in Teflon. Things just keep chugging along and we don't ever seem to get the correction that many have been expecting. So should we give up on the idea of seeing a pullback in equities, Axel? Axel Merk: Maybe. Maybe we should. And for full disclosure, I have been most cautious on the market. In recent weeks, I've actually become far more neutral, even taking a small equity position. And the reason is not so much that I want to throw in the towel. I look at it in the context of everything that I do. I actually think we're in the late stages here of the economic expansion, but what we got is we got this enormous economic stimulus in the system and that does provide a tailwind, obviously, for earnings. The question, then, is, what's going to derail that? Now, I caution that most people have gone along for the ride and not taken chips off the table. And for anybody, I urge them to make sure that they should revisit what they have and then stress test their portfolios. But at the same time, when you have that stimulus here, that obviously is a factor. Now, at the other end of the spectrum, you have the global threats. As we talk, it's the eve ahead of the European Central Bank meeting where Mr. Draghi is again going to say, "Hey, the global trade outlook is uncertain and the ECB is expected to downgrade its growth outlook." But let's keep in mind that our Executive Branch does a lot of huffing and puffing, but when it comes to the real impact on the economy, trade is a fairly small segment of that. And while that uncertainty might reduce some investments, I do think it is more than compensated by this economic stimulus. Also, keep in mind even though interest rates have been going up, inflation keeps ticking up and so I don't think that things have gotten tighter. Not only do I not think so, the metrics I look at, the easy access to credit hasn't changed. And so, access to credit is abundant, and that means we're going out full throttle on the economy. And while obviously we've had many, many a bull market, betting against that has been very costly and many of the bears have just folded. Mike Gleason: Yeah, very well put. Now, the FOMC will be meeting in less than two weeks. It seems all but certain we will have a rate hike this month and then maybe again likely in December. Employment data has been strong. The government statistics show price inflation is relatively under control, and GDP data is showing some growth. So, it looks like the Fed has plenty of cover to keep hiking, even if President Trump is starting to complain. At some point, however, higher interest rates should start weighing on economic growth. That is what Trump is worried about, of course. Where do you think that point is? And are we there now or can the Fed stay the course, perhaps get another couple of rate hikes this year and then maybe four to five total rate increases between now and the end of next year? Axel Merk: Well, a couple of things. The first, generically speaking, Mr. Trump has obviously indicated his displeasure about higher rates. And some people shrug it off, saying, "Well, the guy is just saying something. We shouldn't worry about it." It does matter. Fed policy is all about perception. If people believe the forward guidance, if they believe in monetary policy, it is much cheaper. If you just say you're going to do something without actually doing it, you don't have to print the money, you don't have to hike rates or whatever it may be. So, if it gets torpedoed by somebody influential, like the president, it makes policy more expensive, which means that they might have to hike rates further. I'm not suggesting that the independence of the Fed is somehow jeopardized, but it just might make it more expensive. It makes perfect sense that when Trump said, "Hey, the Fed is doing the wrong thing," that the long bond sold off, that it is more expensive than financing. It's more expensive for the U.S. when it gets torpedoed. So, that's one thing on the side. Now, my view has been for some time that the market is underpricing rate hikes. The reason is partially what I just said. We have an economic stimulus in the system. We finally have wages going up. Wage pressure's gradually increasing, and unemployment is, of course, at very, very low levels. And even with all of that we are still in the "accommodative" mode, meaning we're still providing a stimulus on the monetary side. Makes no sense to me. That means, unless something drastic happens, they'll continue marching on. Now, the whole point of hiking rates is to make financing more difficult. That's the whole point of the exercise. That has not happened yet. So yes, they will continue marching on. The level of the S&P is not in the interest of the Fed, no matter what people say in the blogosphere. The reason so many people say that is because in 2008 and quite some time thereafter, it happened to be perfectly correlated whenever there was bad news. Equities sold off and the Fed printed money or eased further. Now the last time we had this was in early 2016 when fracking was in trouble. People said, "Oh, it's the first domino to fall. It's going to spread over." Now, we don't have that. The only kind of red light or canary in the coalmine we have is emerging markets. Emerging markets are the weakest link. They start flashing, "Hey, access to financing is getting more difficult." And at some point, yes, it will propagate up the value chain and make it to the U.S. economy as a whole. We aren't there yet. We're monitoring that very, very closely with many, many metrics. I happen to think that this economy will overheat, which means that the Fed will have to tighten more than people would think right now is necessary. And so, every day it changes a little bit what the market is pricing in, but the market is pricing in 1.48 rate hikes more this year, one rate hike being 25 basis points, or 0.25%, which means less than two for this year. I don't see how we cannot have two this year. For next year, we have less than two rate hikes priced in right now. To me, I don't see how that's possible unless we have some curve ball hit us. Obviously, if something bad happens on trade or this or that, then it happens. But if you look at our dear president, he says everything is horrible with Russia, he meets the Russian president, everything is great. The same thing for Mexico. Everything is horrible, then he has a speakerphone conference call, everything is great. Everything is bad with Canada, and sure enough, just a day before we talk here, an agreement seems to be reachable. So all these things appear to get into a direction with ... and by the way, even with China, some new talks were just announced. So it does appear that we're not heading to this abysmal trade war. Then, if you take that risk, or reduce that risk, I can see two rate hikes more this year and four next year. Mike Gleason: Is it feasible for our central bank to stay ahead of the other central banks throughout the world by such a wide margin when it comes to interest rates? I mean, at some point this imbalance that continues to develop is going to really put some serious stress on economic markets, not just here in the States, but internationally, right? Axel Merk: Well, yes and no. The mandate of the Fed is, and there are plenty of mandates, it's about inflation, it's about employment, it's about financial stability. They're all related to the U.S., and so the rest of the world is only relevant to the effect of the impact that it has on the U.S. The U.S. is a fairly closed economy. About 15% of the U.S. economy is related to trade. Most of it is not. That means the U.S. can push things quite far before other things happen. That doesn't mean Argentina won't have a problem, or this country won't have a problem, but it doesn't matter to Fed policy unless and until it affects U.S. consumer, U.S. growth, access to credit for corporate U.S.
Now, that said, of course at some point something has to change the spread between the U.S. Treasury securities and the bunds, the German securities, are a mile wide. That is not sustainable. A lot of that is, of course, unofficial because Mr. Draghi, the head of the ECB, who by the way is retiring at the end of next year, wants to have it this way. Indeed, at the ECB meeting, and some of your listeners will listen to it after we talk, but he doesn't like it that the euro's appreciating. He wants to keep things low. But the only thing you do with that, you increase tension because at some point we have to move away from that. Even the ECB says that, "Hey, we have an economic stimulus in the U.S. Fiscal policy in the EU is expansionary. Monetary policy in the EU is expansionary." That all means inflation should move higher. Guess what. The ECB predicts 1.7% inflation for this year, next year, and the year thereafter, all perfectly stable. I think that's a bunch of hogwash, and so we have to watch about is the next person at the ECB going to be just as stubborn, so to speak? And be that as it may, how will the markets react? I happen to think that there will have to be a substantial adjustment in the market. So yes, that means more volatility, which, by the way, higher rates imply, generally speaking anyway. But yes, things will be interesting. By the way, we have the euro as we speak is at about 116. It's been reasonably volatile but on the scheme of things we're not a parody for those that think that�s where it should be given the disparity. Mike Gleason: Turning to metals now, you recently Tweeted a chart of the gold to silver ratio. Axel, it currently comes in at 84 ounces of silver to buy a single ounce of gold. The ratio hasn't been that high since 1991. At least in the past few decades, the ratio going over 80 seems to be a pretty reliable signal that markets are going to turn. Now, if history repeats, we may see silver outperform gold, at least in the near term. What do you think of the sort of extreme we're seeing here with silver so cheap relative to gold? What do you think that means for the markets? Axel Merk: Well, I don't know. And I say that quite honestly. I tweeted that chart because somebody tweeted a short-term chart and I said, "Well, let's look at a long-term perspective." It's as reliable an indicator as that there will be a recession again in the U.S. We just don't know how. Any such ratio doesn't tell you anything about timing, and so we can read the bushes day and night that this ratio should be narrowed, but is that going to happen tomorrow, or in five years? We just don't know, so that chart doesn't tell you anything about timing. Obviously, silver has much more industrial use and as a result has much more complex dynamics and is much more thrown into how other industrial commodities are doing, while gold is kind of in its own thing. Yes, at some point it will have been overdone. But is it now, or is it even at a higher ratio? And that's just very, very difficult to say. Now, if you take gold, which has less industrial use, it doesn't have cashflow � well, obviously silver doesn�t either � but it's just the purest monetary indicator. The question is, and some people say, "Oh, why hasn�t it gone through the roof?" Well, the other question is, "Why hasn't it fallen very sharply even though interest rates have moved higher?" And I have two explanations. One is that on the one hand, as interest rates have moved higher, inflation has also moved higher a little bit so real rates, which is really the competition that gold has, haven't really moved higher. And the reason from a fundamental point of view, the reason is that stocks have cash flow. And when interest rates move higher, when volatility moves higher, then those future cash flows get discounted more. While gold doesn't have a cash flow, there's not any discounting to be done. Historically, that's at least my explanation why in a bear market gold does so well. Some people have been frustrated that, with all these "crises" around the world, gold hasn't gone through the roof. But a crisis is in the eye of the beholder, right? Is a presidential tweet really a crisis? I think it depends on your political conviction. The market has deemed that it is not. Mike Gleason: Diving a little bit deeper here, metals have been clobbered quite a bit over the last couple of months. We've chalked it up to the dollar's strength in foreign exchange markets and higher interest rates, coupled with a lack of demand for safe havens. The mood on Wall Street is certainly still risk on, as we talked about earlier. But we would like to get your take on the recent weakness. Are we overlooking anything that would help explain the fall in gold and silver prices here in July and August? What do you see for the metals ahead? The charts seem to be pretty ugly, but on the other hand the Commitment of Traders data does show the market pretty well primed for a rally. What are your thoughts there? Axel Merk: Well, the beauty about charts is you can interpret anything into them as you wish. So let's just take a step back. The dollar had done quite well as the tax reform package was about to be passed and then sold off significantly. Then people realized, "Oh my God, rates go up anyway and they don't go up in the rest of the world,� then went up. But if you look at the price of the dollar versus the major currencies, not versus the emerging market currencies, it actually hasn't moved all that much. It has moved a little bit. Part of it is I just mentioned this thing about the ECB that these lower rates aren't sustainable. I don't think I'm the only one saying that. It's just very popular at times to be negative on the euro. So at some time, something has to move. If I look at what is priced in as far as in the futures market on where rates will be, they don't move by much but they move a little bit. Or you'd have things like Italy. Suddenly, Italy has found fiscal discipline. Lots of headlines about how they'll keep the budget in check, and the euro's doing better. Now, obviously, most people don't think Italy's going to be fiscally sound, but people will think that maybe they don't get so much done, which means they don't get bad things done either. A lot of good news has been priced into U.S. markets. Now, all that said, clearly the U.S. economy is doing well. Clearly rates are moving higher in the U.S., and so that is a tailwind for the dollar. In the meantime, too much of a good thing then gets some backlash. You pointed out, the speculators are piling in on one end and so that's why usually they unwind. So in the short term, when you're trying to have a fundamental interpretation as to why something happens, you tend to get whacked one way or the other, simply because you have some internal dynamics drive things in a different way. One of the things that has happened quite a bit in recent months, we see these end-of-the-month flows where institutional investors are rebalancing their portfolios also across borders, and that often has a bigger influence than the economic news of the day, except when you read the headlines in the news you think it's all because of an economic headline. Part of that is simply because journalists need to write something every day. Mike Gleason: Yeah, very well put. Well, as we begin to wrap up here, Axel, give us any final thoughts that you may have for us today, or maybe talk about some of the data points or potential events that you're going to be watching most closely in the near term and then also how you assess things for the economy and for the markets the rest of the year. Axel Merk: My view is that we're watching an economy that may be overheating, and the question is, well, what does it mean for investors? Obviously, that question is, how long do you want to ride that wave and go along for the ride? I personally can take position on rising rates. That's not so easy to do for an individual investor. You need to use derivatives to do that, and I'm certainly not advocating that individual investors should start playing the futures market or options market or anything like that. But one can take direct advantage of that. I continue to own gold because I like it as a diversifier and I also think inflation's going to move higher, but it's this odd dynamic, right? Whenever you have high inflation numbers come out somewhere, a currency of the country often goes up because of an expectation of a future rate hike. Then the currency weakens in the medium term if the central bank doesn't really do anything about it. That's really what I see in the attraction of gold, amongst others, is that I don't think the Fed is going to be fast enough. When I say overheating, I mean that inflationary pressures at some point are going to a little stronger than expected, not just a little bit stronger, but persistently stronger. And that is an environment where gold can do quite well, for example. But most importantly, investors, in my view, should stress test their portfolio. Can you sleep at night when the market goes against you? People who haven't re-balanced in quite some time may well be over exposed to specific areas. Mike Gleason: Well, thanks once again, Axel. I always love getting your take on the state of things, and we very much appreciate your time today. Now, before we let you go, please tell listeners a little bit more about your firm and your services and then also how they can follow you more closely. Axel Merk: Sure. MerkInvestments.com is our website. Browse around there. We do a lot of things. We publish our views. We publish chart books on different aspects, if you want to dive into interest rates, the business cycle, the market, a lot of things. If that is too academic for you, follow me on Twitter where you get live interpretations, really get up to the second use once in a while on my views. Connect to me on LinkedIn. We try to be in most places, and depending on the channel, so to speak, as we call them, you get different amounts. On Twitter you get more, on LinkedIn you get less, but we have a newsletter if you want to be informed on the things we do. Our website is a good starting point, or whatever your favorite social media site is, or just on (Money) Metals Exchange, where if I'm lucky I get invited back in a few months. Mike Gleason: Well, excellent. Thanks again, Axel. We do look forward to catching up with you towards the end of the year, as we dissect this all again. Until then, take care and thanks for joining us.